As a big Sherlock fan - both of the BBC show and the stories - I was really excited to read this book. Not only is it YA Sherlock, but it's also a female version of Sherlock. The book mostly met my expectations. I really liked Jamie. He was a bit of a blank canvas, as Watson traditionally is, but he also had a personality. He was intensely loyal to Charlotte (to the point of straining credulity), had a bit of a violent streak, and was also very resentful of his father. Many reviews describe Charlotte as unlikable in a way that female protagonists usually aren't. I didn't find her unlikable. She had hard edges - the personality you expect in a Holmesian character - appears to be uncaring, ruthless, etc. But I thought it was easy to see beyond that to a person struggling with her own demons - both of addiction and of things that had happened to her - as well as the drama of being a genius in a sea of normal people. She has a good heart. She just hides it well. The plot was surprisingly compelling. I say surprising, because it took me awhile to get into it. Essentially, Jamie and Charlotte are being framed for murders that recreate the murders in the original Sherlock books. It felt a bit silly at times, but if I let myself get into it, I really enjoyed it. I particularly liked several twists at the end that I wasn't expected. It made for a more complex story. My only large criticism of the story is that Charlotte's personality follows the BBC Sherlock version too closely for my taste. I listened to an interview with Brittany Cavallaro, and she came off as well versed in a lot of different Sherlock adaptations. So it's not like BBC Sherlock is her only knowledge. But at times, Charlotte seemed so much like Benedict Sherlock that I rolled my eyes. 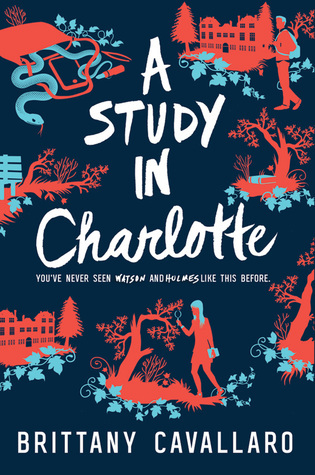 Although not a perfect book, A Study in Charlotte is a solid Sherlock Holmes adaptation. It's loyal to the original characters (or the descendants of them) and also has a well crafted, independent plot. Recommendation: Borrow if a Sherlock fan. Otherwise probably skip. I liked this one and picked it up because I'm a Sherlock fan (stories, and BBC series), but I just wished the author would let her characters breathe and become their own without forcing the connections to the origins. It was entertaining, but I had hoped for more.